Just endorsed by the Professional Committee, the IFLA Library Reference Model (LRM) is now available on the IFLA website. Released earlier this year, PRESSOO is a formal ontology designed to represent the bibliographic information about continuing resources, and more specifically about serials (journals, newspapers, magazines, etc.). It is an extension of the FRBROOmodel (Functional Requirements for Bibliographic Records – Object Oriented). FRBROO is in turn is an extension of CIDOC CRM, the conceptual reference model for cultural heritage information. PRESSOO aims to propose answers to long standing issues with the application of the FRBR family of models to serials and continuing resources. 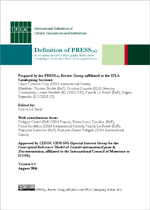 The Definition of PRESSOO was approved by the IFLA Committee on Standards and then endorsed by the IFLA Professional Committee at its meeting in March 2017. 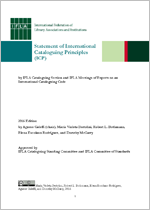 More than fifty years after the original Statement of Principles – commonly known as the “Paris Principles” – was approved, IFLA has published the latest revision, the Statement of International Cataloguing Principles (ICP) 2016. The principles in the statement are intended to guide the development of cataloguing codes and the decisions that cataloguers make. They apply to bibliographic and authority data, and consequently to current library catalogues, bibliographies and other datasets created by libraries. They aim to provide a consistent approach to descriptive and subject cataloguing of bibliographic resources of all kinds. 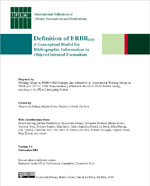 Earlier this year, the Committee on Standards also announced the publication of the Definition of FRBROO: A Conceptual Model for Bibliographic Information in Object-Oriented Formalism. FRBROO is an ontology or high-level conceptual model for bibliographic data. The model is closely related to IFLA’s FRBR family of conceptual models; it is the object-oriented version of these models. FRBROO version 1 was based on FRBR alone, while FRBROO version 2 is based on the three models: FRBR, FRAD and FRSAD. Look for final versions of these IFLA Standards to follow shortly!